During our years in business we have built up an excellent reputation for our quality of work and professional, friendly and efficient service. Fully insured, Worcester Accredited and Gas Safe Registered our company has developed its reputation by offering customer satisfaction and value for money, whilst our respect for the environment sets us apart from our competitors. Established in 2005 and managed by Phill Whittaker, a qualified and accredited gas engineer with 20 years experience, we have the knowledge and expertise needed to ensure that you receive nothing but the best service. We are committed to exploring the latest technology to reduce your heating bills and can install all models of smart controls. We are proud to be an accredited Honeywell evohome installer, a sophisticated system that lets you individually control up to 12 heating zones in your home. Servicing Leeds and the surrounding areas, we endeavour to minimise our impact on the environment by installing high efficiency products that will significantly cut your home's CO2 emissions. Whether you are a private customer looking for a personal service or a landlord looking for someone to manage your complete heating requirements then Efficient Heating Solutions can deliver what you need. You can rest assured we will tidy up after ourselves and always treat your home with care. 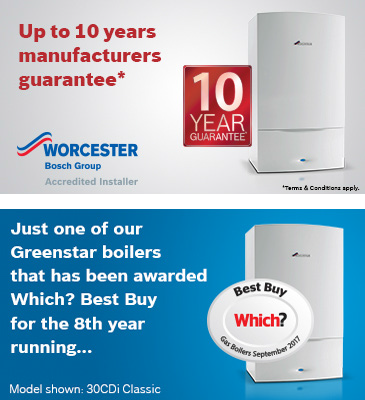 Worcester Bosch ensures our clients receive a high standard of workmanship and professionalism. Our accredited companies are monitored by several recognised trade and industry bodies.